A blog dedicated to those with a passion for creating. I started quilting in January 2009. I know this, not because it was insanely memorable, but because at the same time I started a quilting journal. I have used the journal to write information about every quilting project I have started. 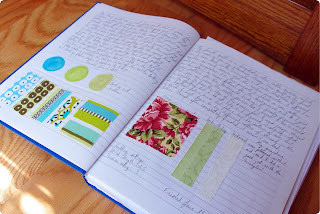 I use it to remember patterns and fabric I liked and remind myself of what worked well and what worked not so much. 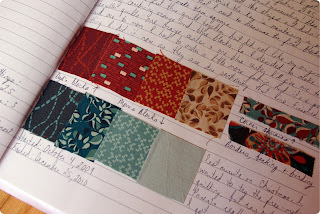 I also add a swatch of as many fabrics as I can fit on the page and include what part of the quilt the fabric came from. The most important thing is that I have a catalog of what I've done to pass on to my family. Good luck tracking your projects! thank you.. just finished a quilt for my oldest granddaughter.. top stitching not great.. but she loves it..